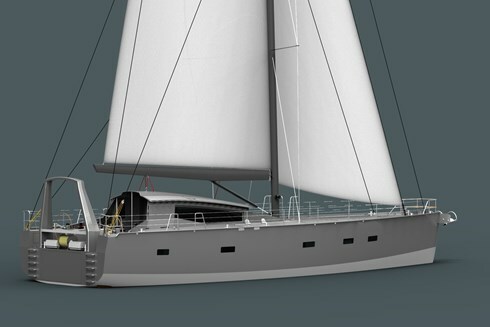 The 66’ expedition yacht Qilak, designed for exploration and adventure in the Arctic and Antarctic regions is coming together as a kit of aluminum parts in Holland. This is an exciting departure for our office, a blue water yacht that has been engineered in aluminum by David de Villiers, instead of the composite builds we are best known for. Qilak (from the language of the Inuit) will be joined together during the Summer in the main hall at KM Yacht Builders in Makkum. In the first of the photos we see a plan of a typical frame section sitting on top of a mass of pre-cut and welded frames. In order to make the most cost and time effective build possible the entire yacht must be designed and engineered down to the last detail before construction can begin. When the design process is complete, the constituent parts are allocated to aluminum sheets of different thickness depending on their duty and location in the yacht. This process is known as nesting. It ensures the maximum use of material per tonne of raw sheet. At this point the frames, bulkheads, hull and deck plating are cut, including all lightening holes, conduit and other details. 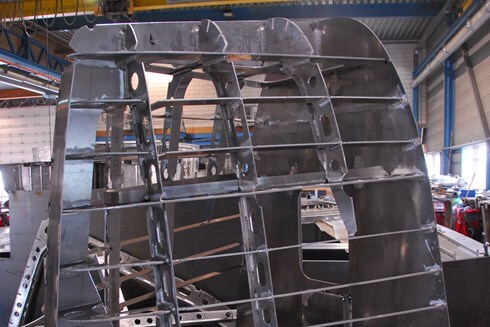 These individual components are then welded together to form parts of the yacht, such as the bow frames above and some of the aft sections below. These component parts are eventually joined together to form the structure of the yacht. In the picture below we see the largest component set out so far for fabrication. It is the coachroof and deck superstructure which is inverted so that what we are seeing is the deck-head, without its supporting frames and longitudinals.